It is amazing how modifications to the azole structure have produced ever more potent, ever more useful antifungals. Ketoconazole had limited usability because of its many side effects related to off-target sterol synthesis inhibition, solubility (or lack thereof) and erratic absorption. Solublity was also an issue for itraconazole and posaconazole. Schering worked on posaconazole for more than a decade, trying to find a formulation suitable for more than just prophylactic use. And then there is Voriconazole (Vfend®), a drug we learned to love despite a long list of issues. It requires co-administration of a cyclodextrin (SBECD) to make the IV solution, well, soluble. There is a very long list of drug-drug interactions filling the pages of the Package Insert. Fluconazole (Diflucan®) was always the big exception: the oral drug had good bioavailability, and the IV formulation did not require any formulation wizardry. It led the azole chart of MVAs (Most Valuable Azoles) for more weeks than Elvis trumped the Billboard Hot 100 chart with ‘Hound Dog’. Companies like Janssen (ketoconazole and itraconazole) and Bayer (clotrimoxazole) worked on azole chemistry for many years. Both had a big stake in the field and knew about the potential of the class for mold infections. But progress was slow in coming until voriconazole became available. Compared to amphotericin B, voriconazole had a winning profile. Although only fungistatic (like all other azoles), it nevertheless proved to be as effective as the much more toxic AmB in the treatment of Aspergillus infections. This was nothing less than a breakthrough. The fact that it also covered Candida was of little significance. This March FDA approved isavuconazole (Cresemba®) for Aspergillus and Mucor infections. Hence, it is an appropriate time to compare both azoles side-by-side in an unbiased fashion. Below a tabulated comparative listing of core attributes which are important to practicing clinicians. The major drawback of voriconazole is side effect profile in general, and the drug-drug interactions in particular. Doctors also need to be on the look-out for CNS effects and warn patients in advance about visual disturbances. There is a lot to like about isavuconazole. 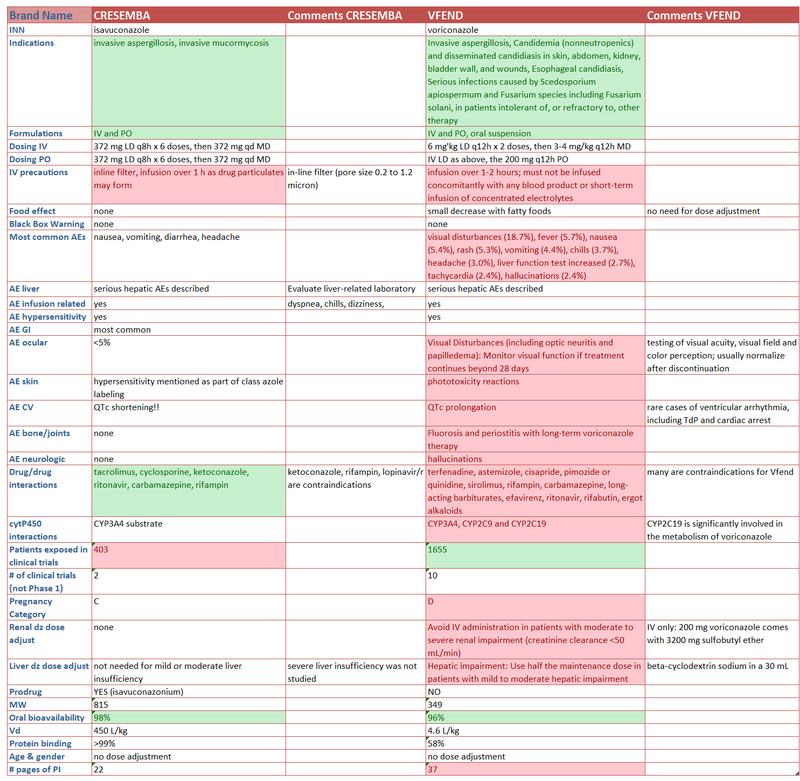 Importantly, the list of DDI and AEs is significantly shorter. However, as always there are some big Rumsfeldian “known unknowns” and “unknown unknowns”, the former we can address here. It is the limited data situation for Cresemba which is perhaps the main concern at this time. Hopefully, with the accrual of more data, Astellas / Basilea can build a more robust database of both efficacy and safety data and alleviate this concern. Prospective enrollment of Mucor and Aspergillosis cases into a well-controlled trial is an extremely difficult task. It is unrealistic to expect from sponsors that they engage in what could turn out to be a decade-long effort. It would make more sense to grant provisional approval based on interim data while continuing the recruitment effort. This way, interpretable data would be generated in the long run instead of having to deal with uninterpretable data comparing the test drug with historical controls. Or no controls at all. Did you know that cyt450 2C19 is the major cause for voriconazole’s DDI profile? This apparently was an ID Board question a few years ago. Did you know that cyclodextran is classified as GRAS by FDA? The same cannot be said for SBECD, a novel version of beta-cyclodextran. Which other azole was approved in the last 12 months? Actually, 3 azoles were approved: luliconazole (Luzu®) and efinaconazole (Jublia®), both for topical treatment of tinea. An IV formulation of posaconazole (Noxafil®) was approved for prophylaxis of Candida and Aspergillus infection this year. Which other azole is co-formulated with cyclodextrin? You guessed right, it is itraconazole. 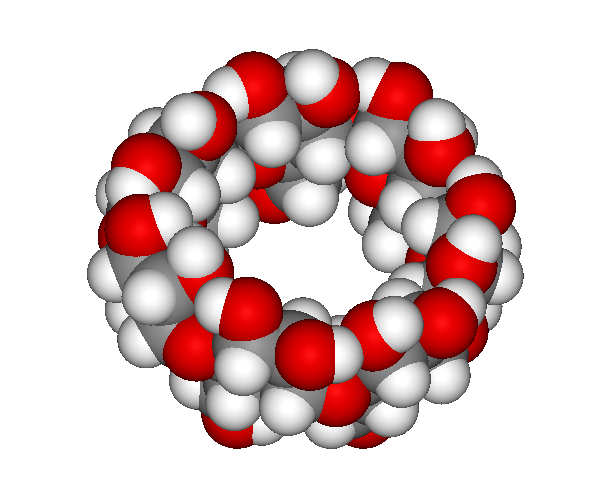 What other drugs use cyclodextrin for solubilization? More than we have space to list; there are at least 30 different compounds that are co-formulated with cyclodextrin to improve solubility or oral absorption. This entry was posted in Did you know...?, QIDP Antibiotics, The News, The Viewpoint and tagged amphotericin B, antibiotic blog, aspergillosis, aspergillus, Astellas, azole, Basilea, Bayer, candida, clotrimoxazole, Cresemba, cyclodextran, Diflucan, efinaconazole, isavuconazole, itraconazole, Janssen, Jublia, Ketoconazole, luliconazole, Lulu, Mucor, Noxafil, Pfizer, posaconazole, SBECD, Schering, Sporanox, tinea, Vfend, Voriconazole by Harald. Bookmark the permalink.